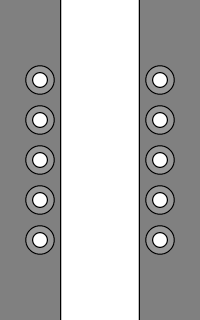 Lacing across the ankle area in "2-1-3" sequence creates a firm Double Cross that reduces pinching and may help prevent painful "lace bite" in tightly laced boots or skates. • Cross the ends on the inside and emerge through the set of eyelets two rows higher up the shoe (skip past one pair of eyelets). This is row "2" of the "2-1-3" sequence. 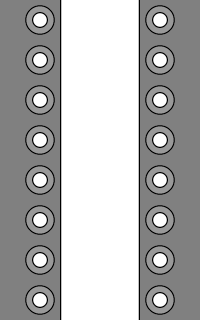 • Cross the ends on the outside and feed in through the next lower set of eyelets. This is row "1" of the "2-1-3" sequence. • Cross the ends on the inside and emerge through the set of eyelets two rows higher up the shoe (skip past one pair of eyelets). This is row "3" of the "2-1-3" sequence. Heavy boots such as work boots, logging boots and army boots as well as active footwear like ice skates and roller skates are often tightly laced in order to provide stability during vigorous activities. This tight lacing can cause the leather to pinch and press into the tendons on the ankle upper, which in turn can lead to a painful condition known as "lace bite". The theory behind 2-1-3 Lacing is that the three overlapping crossovers form a very firm section that makes the boot less likely to pinch and instead conform more evenly to the bend in the ankle – especially during the "breaking-in" period. Note that 2-1-3 Lacing is probably not a good solution for someone already suffering "lace bite" and seeking relief. Instead, a more open method such as Gap Lacing is preferable because it actually removes pressure from the affected area. Red Stone roller skates with 2-1-3 Lacing. Lengths available: 36" 40" 45" 45" 54" 54" 63"
Shorter ends if existing shoelaces are re-used (-5% on average). "I've just recovered from a sprained ankle and remembered the 2-1-3 lacing method from figure skating. It feels great! Right foot has the injury/is actually how I wear the boot currently. Tightening is difficult!! (but worth it)." "I got my first pair of White's boots about 20 years ago. I was living in Colorado in the western United States, where these boots have been relied upon by generations of ranchers, firefighters, and outdoorsman for over 100 years. At the time, a seasoned wildland firefighter "in-the-know" schooled me in the proper care and wearing of these unique boots, which are handmade in Oregon (USA) and are completely rebuildable. That edubication included gems like filling new boots with boiling water to soften the leather, pouring it out and lacing them tightly to customize the fit (the shank is leather vs steel), and lacing them this way. The leather in the upper and shaft is 7-8 oz leather, and quite a bit heavier than the leather in most other shoes. Factor in the fully gusseted tongue (which is folded over double when lacing), AND lacing in a full length leather brush guard/kiltie, you're looking at 4-7 layers of leather right at the fold at the ankle. The resulting stiffness, which can be made worse by traditional Crisscross lacing, is referred to as boot bite in these new and stiff boots, due to the resulting pinching on the top of the foot. 2. It "trains" the boot to flex properly while breaking it in by allowing the laces to shift. The "boot bite" I mentioned (which, ironically, my friend calls "White's bite") is a common problem for this type of leather boot when its new and stiff and still breaking in to your foot. While I have adopted (and adapted) this lace style for my everyday use, my friend prefers it for new boots only." If you'd like to send feedback about 2-1-3 Lacing, please Contact Ian. 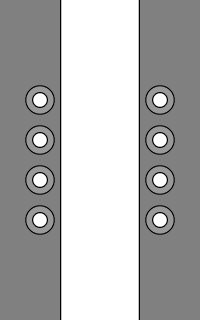 Identical 2-1-3 path used on whole shoe, more as a decorative lacing than a functional lacing. Opposite concept that skips crossovers at the ankle to reduce pressure. 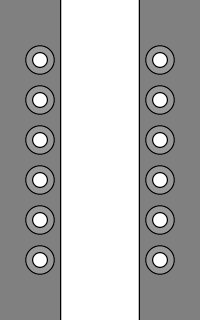 Basic lacing used both above and below the "2-1-3" section at the ankle. 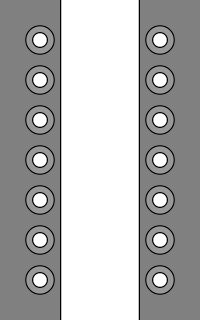 View and customize 2-1-3 Lacing using Create-a-Lace.